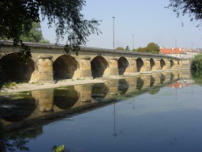 Not too far from Germany, about 3 hours from Paris by train on the way to Strasbourg and south of Luxembourg, even not so far from Belgium, puts Metz in a peculiar geographical location. 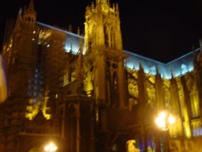 This is a very special city, very beautiful, full of flowers, a very family city, clean and civilised. The best item of food is definitely the quiche, which is available in many varieties and can be a world apart from the stuff you get in other countries. There are many wonderful buildings to see here, starting with the railway station. The whole area has a very Mediterranean feel. In the summer months there is a mirabelle festival, celebrating a fruit that seems to be a cross between a gooseberry and an apricot. 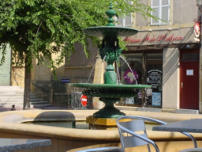 The locals speak mostly French, but with a local variation which is quite confusing even to other French people. There's a strong and recent German influence, as you would expect. The amount of English spoken is limited, and they appreciate your trying French. Best time to go is in the summer. It's very hot, they have their own peculiar micro- climate. The flowers are out and people sit in the square until the early hours drinking and chatting and eating Steinhoff burgers. There are too many nice restaurants to list here. 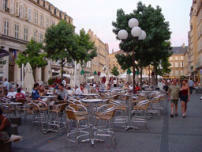 Restaurant Maire is a particular favourite, as is Le Bouchon and you don't have to pay big city prices anywhere here. Look for the booklet listing the top restaurants of Metz. Try as many as you can. 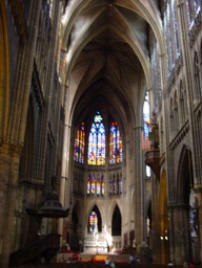 The cathedral is the tallest gothic cathedral in France, or was that Europe? 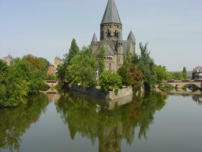 The Moselle runs nearby, and sitting in or around the river is a very pleasant activity. 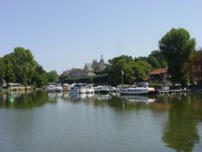 There are boat rides, boats to hire, little trains to ride and lots to do. The museum is interesting and quaint in a local way, and there is a little train that takes you round many of the highlights if you have only a little time. Particularly, walk round and look at the flower exhibitions, all designed and maintained with loving care and attention. A few of the well-known big shops are there, but mostly there are small local shops which are worth investigating. Everything is within walking distance, and, if you have to use a bus, they are cheap and the drivers are particularly helpful. 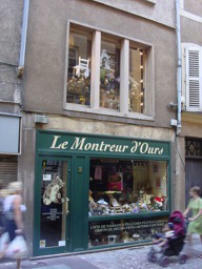 There is one quite excellent bear shop in Metz, and we always make that an early visit. It is very compact, with windy stairs, but there is a huge selection of bears of all kinds and related items, and the lady who runs it has very good taste. One of the real highlights of a summer visit is the "dancing waters". In the park at sunset (ie around 10pm) for about 30 minutes you are able to see a music and water spectacular, always quite exceptional. Weekends only, free, check times for exact start and get there early to secure your place as it is very popular. Good day trips could include Nancy, Strasbourg, Luxembourg... Why not combine Metz with another centre?